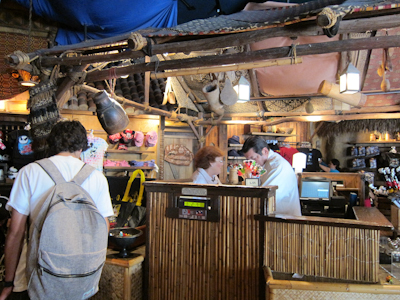 So right next to the Indy Outpost (connected even) is the Adventureland Bazaar. 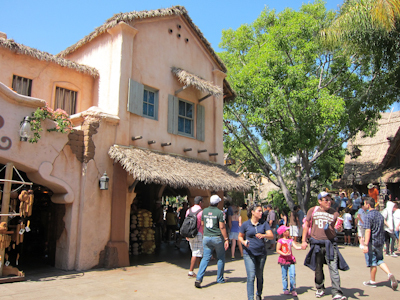 Now the Adventureland Bazaar is closest to the now closed Aladdin’s Oasis Dinner Show. First, I never attended the Aladdin’s Oasis Dinner Show which, according to Yesterland, only ran for a couple of years. Those years I happened to be living in the Midwest and completely missed it. On another note, I completely missed the Rocket Rods too–a ride using the Peoplemover track. But I heard it wasn’t that great. Anyway, now Aladdin’s Oasis seems to be just a meet and greet for Aladdin characters. Which I very rarely see open, so I think getting in there is going to be a challenge. 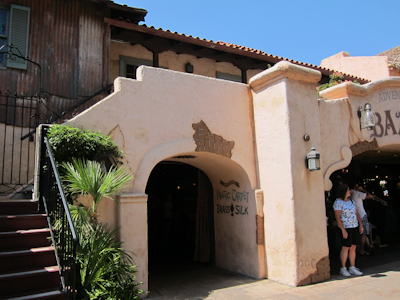 It’s really too bad because apparently the Oasis shares a kitchen with the Plaza Pavilion, another waste of space in the park–formerly a restaurant, currently useless. 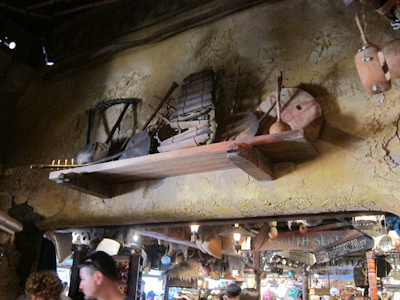 Anyway, it did inspire the Adventureland Bazaar, and that’s what I’m going to talk about today. 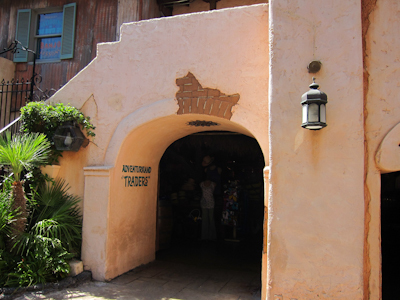 The Bazaar, representing the Middle East, is rightly located and connected to the Outpost, representing Africa. Because Disney is all into truncated geography like that. 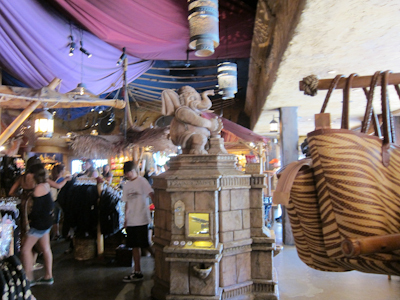 The Bazaar is actually on the corner part of the store area. You know, the corner part. Cause that makes so much sense to someone who hasn't been there. There’s lots of different details around there, in true Disney fashion. Because when I think about the Middle East or Africa or anywhere, really, I always think "Tattoo parlor and banjo lessons in the same building? Genius." I guess it does say “Oriental tattoo” which makes it better? Or not. Check out Hanzi Smatter. But I can’t help but wonder what an actual Disneyland tattoo parlor would look like. I mean, getting permanent, real tattoos at Disneyland. I bet there’d be a big market for that, really, given how popular tattoos are these days, and I do see a lot of Disney-related tattoos on people at the park. It would be all guaranteed to be hygienic and stuff and then people could brag that they got their Disney tattoo at the Mouse and not some friend-of-a-friend-of-a-friend guy working out of his “apartment” on top of the garage of his parent’s house while they were totally inebriated. I’m thinking it’s a solid idea! Too bad Walt would personally and forcefully rise up from the grave and kill whomever allowed a tattoo parlor in his park. Making that even more complicated is the fact that Walt was cremated. But I’m sure he would be so offended by such a thing that he would go all Mummy or whatever and swirl his ashes back into a corporeal form to express his outrage. And no, he was not cryogenically frozen. You can also buy a magic carpet at the Bazaar, or so the door claims, though I wasn’t able to find any actual magic carpets for sale. Did I really need two pictures of this doorway? What was I thinking? 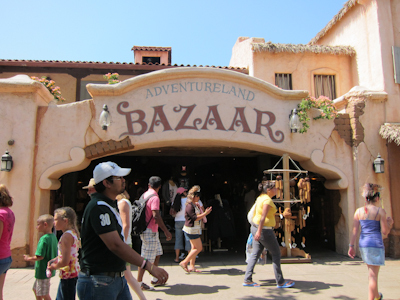 The Bazaar is pretty intricately themed. Here’s an elephant on top of a squished penny machine. I used to love the squished penny thing. Actually, I can remember being a little kid at Knotts and you could clandestinely put a coin on the railroad track and after the train went by you had your very own squished coin, but I believe those days are long gone. 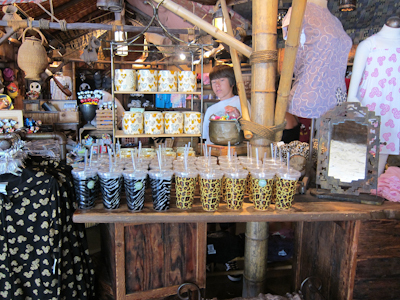 Some of the things for sale are more Adventureland-ish than Bazaar-ish, like these drinking vessels. What's with the zebra print? Do people really buy these? I love the totally authentic Panda bears. They’re Disneyland’s version of a Pillow Pet. "Mommy, I want a panda to symbolize my visit to the Middle East/Africa section of Disneyland!" Theo got a pillow pet for Christmas this past year. Great-Grandma saw a commercial for it and went out to find one. He has the doggie one–it’s really cute! And very soft. Anyway, the Bazaar has some great theming around the ceiling and over the doors. Even the register area is exciting. 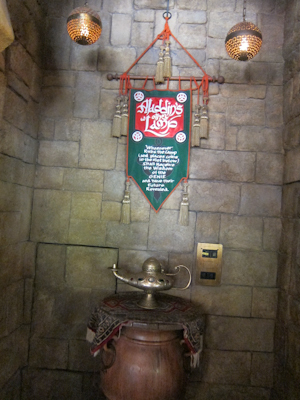 And then in the back of the store, I came to one of those things I never knew existed–Aladdin’s lamp! OMG it's a genie lamp!!! 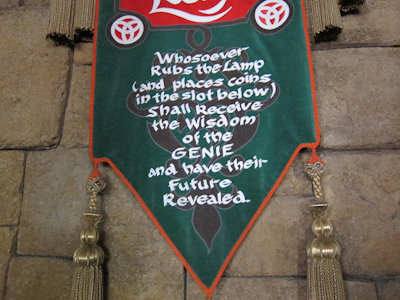 "Whosoever rubs the lamp (and places coins in the slot below) shall receive the wisdom of the GENIE and have their future revealed"
I mean wow, how cool is that? I was all ready to place my coins in the slow below and receive the wisdom of the GENIE, until I saw this. Out of order??? What, is the GENIE on vacation or something??? Bad show, Disney. Bad show! 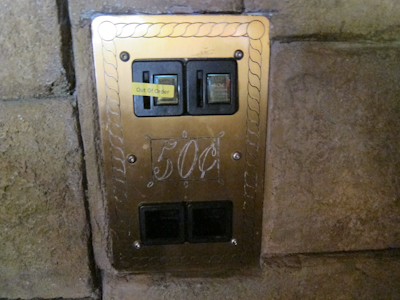 There was the one free coin slot but I was a little nervous to place my coins in it lest that one be out of order too and just not marked. I didn’t want to waste 50 cents if the GENIE wasn’t going to pony up my future. So I’ll have to go back and check it again. Anyone gotten a fortune from this machine GENIE? What did it say? That made me laugh out loud. and I’m at work, supposedly looking busy. The little spiel (however you spell that) the genie says is quite humorous. Also, when you get a penny pressed in that machine, the elephant raises and then stamps down as the penny is pressed. Cool store- I worked there for almost four years. 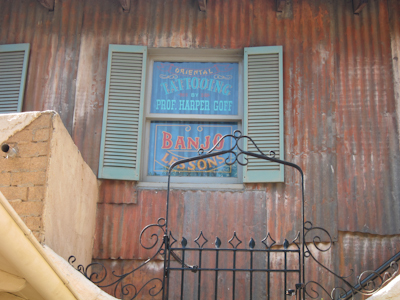 Re: The tattoo parlor and banjo lessons: Harper Goff was one of the original planners of Disneyland, responsible for much of Adventureland. He was also a designer on many Disney live-action films and was responsible for the design of the Nautilus in 20,000 Leagues Under the Sea. The story behind his window is that he’s an American transplanted to whatever country Adventureland is supposed to be and he’s eking out a living there.